Most birds of paradise are found in the upper ranges of the forest canopy. Birds of paradise outshine other birds with their beautiful plumage and spectacular courtship displays. 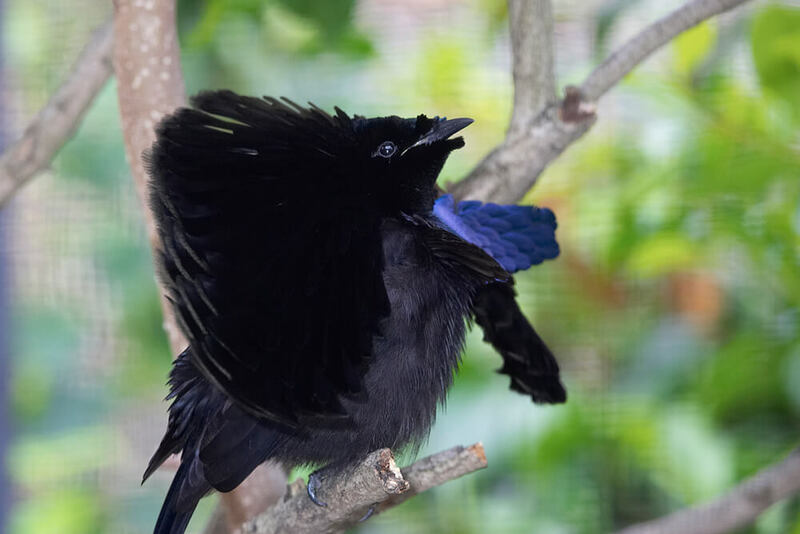 Their gorgeous colors and fantastical trailing plumes gave rise to incredible stories of their origins and habits, and the Malay phrase for the birds, manuq dewata, translates to birds of the gods. Not all birds within the bird of paradise taxonomic family carry the bird of paradise name; there are also sicklebills, astrapias, paradigallas, riflebirds, parotias, manucodes, and the paradise-crow. No other bird group is so beautiful or so rich in variety of plumage and behavior as the birds of paradise. They are usually heavy-billed and rather stout birds, but there are many species, each having its own unique look and colors. Birds of paradise range from the size of a starling to the size of a crow. And that doesn't include the male's feathery tail that can be up to 3 feet (1 meter) long, depending on species! In plumage, birds of paradise range from black to a painter’s palette of bright colors. Some of the feathers are as delicate as lace, while others shimmer with a metallic golden sheen. Some males have wattles, bright-blue mouths, or colored patches of naked skin. These birds of paradise look like something you could find only in an imaginary land. Few travelers ever venture into the dense mountain rain forests of New Guinea and northeastern Australia. Yet that’s where you’ll find most of these unique birds, in tropical forests at sea level to cloudy and cooler mountain forests up to 11,480 feet (3,500 meters). A few bird of paradise species inhabit open savannas, and some species can also be seen in gardens, on the edges of town, flying across highways, or even in centrally located public parks, as long as there are trees. Comfortable in the trees, birds of paradise generally stay in the upper ranges of the forest canopy. Some species do go a bit lower and may occasionally forage on the forest floor. The birds do like to bathe, using shallow forest ponds or even bird baths in yards! Most female bird of paradise species build a cup nest of vines, twigs, leaves, and moss. The small king bird of paradise is unusual in that it nests in a tree cavity. Watch out! Little is known of wild bird of paradise behavior, but it is thought that natural predators include hawks and snakes. Eggs and chicks are the most vulnerable to attack. The feeding habits of birds of paradise are not well known, but it is believed that most species are fruit eaters. Most birds of paradise eat insects; they have been observed tearing apart dead wood to get to insects. Some species have been seen eating seeds, frogs, reptiles, and nestling birds. At the San Diego Zoo and the San Diego Zoo Safari Park, the birds of paradise are given low-iron pellets made for soft-billed birds, as well as apples, papayas, and cantaloupe. During breeding season, mealworms and crickets are added. A male Raggiana bird of paradise does a dance to impress a female. When it comes to making some noise, birds of paradise are not shy! They call to announce their territory, to advertise their location to a potential mate, or to sound an alarm, but with different vocalizations, depending on the species. The male lowland riflebird has a very sharp call, from which it gets its common name, and the brown sicklebill makes a series of short notes that sound like a machine gun. Emperor birds of paradise hum, while magnificent birds of paradise make clicking noises. Other ways to communicate include beating the wings or rattling the bill. When it comes to courtship, birds of paradise are truly amazing and as varied as their colors. 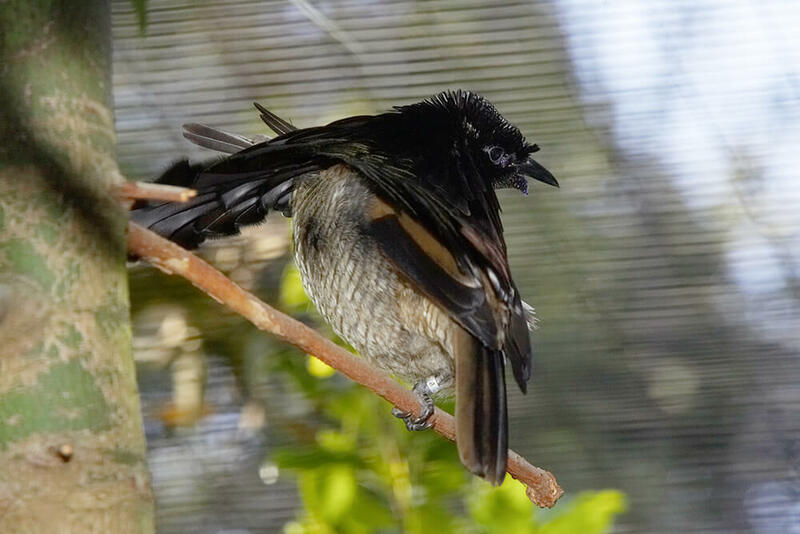 The adult males have plumes, frills, capes, quills, lacy feathers, and/or skirts, with tails that may look like expandable fans, whips, twisted wires, and more, depending on the species. Those tails may look beautiful, but they are not very helpful for flight. Instead, they are meant to help the male show off any number of fantastic dance moves to attract as many females as possible and to outdo rivals. Some species dance in trees; others create a stage of sorts on the forest floor by stripping away leaves to let sunlight shine down on them, spotlight fashion. Many males display in a common area known as a lek, where they compete to catch a female's interest. Displays can include charging and then posturing stiffly, hanging from limbs, or alternately freezing and spinning. Once the male mates with a willing female, he leaves to find yet another female. He takes no part in helping with the nesting or rearing of the young; the female does this job all by herself. Her nest is shaped like a cup and is made of leaves, ferns, twigs, and moss. Nests are often found in tree forks. Exceptional exceptions. Not all bird of paradise species are brightly colored or have fancy feathered "ornaments." And not all males leave the female after breeding. Some species, such as manucodes, are less colorful and flamboyant, the males tend to mate with just one female each breeding season, and both parents help with nest building and chick feeding. Newly hatched bird of paradise chicks have no feathers; their eyes open in about six days. Their feathers start to appear at 8 to 10 days. They fledge at 20 to 30 days of age but may stay with the parent(s) for many weeks before heading out on their own. Females may reach maturity at about one year of age, males usually take longer: two to four years, depending on species. However, it may take males that need fancy feathers for courting from four to seven years to gain their full adult plumage. 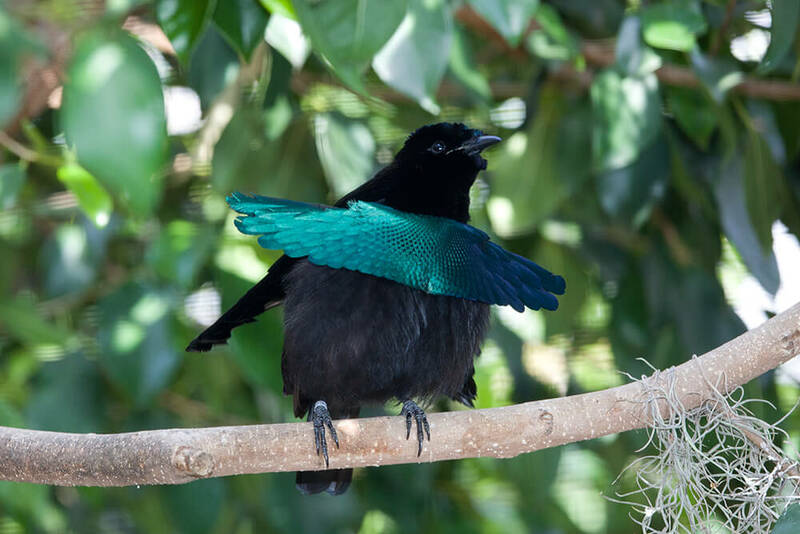 The San Diego Zoo began exhibiting birds of paradise in 1925; over the years, we have housed 19 species between the Zoo and the San Diego Zoo Safari Park. Notable hatchings. In 1968, a pair of lesser superb birds of paradise raised a chick at the Zoo, the first successfully reared young of any species of bird of paradise at the Zoo, and the first hatching of this species in the US. The first Raggiana bird of paradise chicks to be raised in North America hatched at the Zoo in 1981. In September 1983, the San Diego Zoo was presented with the Association of Zoos and Aquariums’ Significant Achievement Award for our Raggiana bird of paradise breeding program. In 1999, a divided aviary opened in the Zoo’s Lost Forest, designed specifically for breeding Ragianna birds of paradise. Guests can see courtship behaviors as keepers rotate males in with a nesting female just before she lays her eggs. In 2001, the Safari Park celebrated the hatches of the first magnificent birds of paradise in our collection. Currently, the San Diego Zoo is home to magnificent, superb, and Raggiana birds of paradise in various aviaries. The Safari Park has magnificent and superb birds of paradise as well, but they are off exhibit in the Park’s Bird Breeding Complex. Birds of fashion. Bird of paradise plumes were known and prized in Asia 2,000 years ago. Skins and feathers were very important to European women’s fashion over a century ago and are still used by the native people in New Guinea in their dress and rituals. During the 1880s and 1890s, some bird of paradise species were almost wiped out because of the fashion of using the bird's feathers to decorate hats. Up to 50,000 skins were exported each year. This practice was finally stopped in the 1920s, when all birds of paradise were protected from export. Today, some hunting is allowed but only to meet the ceremonial needs of the native society. Once the isolated, mountainous island of New Guinea was a bird's paradise. Few predators other than native humans lived there. But contact with the industrialized world has brought the threat of extinction. Islands, by their physical nature, leave many animals with nowhere to go when conditions change for the worse. The biggest problem birds of paradise face now comes from large lumber companies that clear all trees from rain forests for cardboard and hardwood products. Currently, the blue bird of paradise Paradisaea rudolphi, Wahnes’s parotia Parotia wahnesi, and MacGregor’s bird of paradise Macgregoria pulchra are vulnerable. We hope there will still be places in the wild for these avian wonders to continue their courtship dances! You can help us bring bird species back from the brink by supporting the San Diego Zoo Global Wildlife Conservancy. Together we can save and protect wildlife around the globe. Some bird of paradise species top their nests with shed snakeskin. It is thought this might protect the nest from predators. The greater bird of paradise's taxonomic name means footless paradise bird. 16th century Indonesians sent the bird's skins to Europe without the legs, starting the legend that the bird was from Paradise and flew without rest.